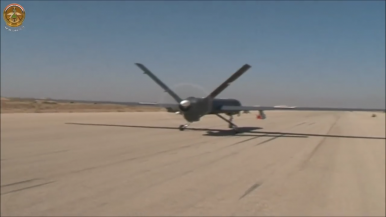 A recently published video shows armed Chinese-made drones operating in Iraq. The Iraqi Ministry of Defense recently released a video showing the launch of a Chinese-made CH-4B combat drone from al-Kut Air Base southeast of Baghdad in the presence of Iraq’s defense minister, Khaled-al-Obeidi. According to the Iraqi defense minister interviewed in the clip, the CH-4B “Rainbow” unmanned aerial vehicle (UAV) shown in the video took off for its first combat mission against ISIS militants in Anbar province. The short video clip also features footage of the drone firing at an alleged ISIS target with an AR-1/HJ-10 anti-tank missile. Iraq has received an unknown number of CH-4B combat drones in early 2015. It is not clear whether China supplied Iraq with just the CH-4B mixed attack and reconnaissance UAV shown in the video, or also with the CH-4A variant, a reconnaissance drone with a 5,000km range and 30-40 hour endurance. The CH-4 is built by state-owned aircraft manufacturer China Aerospace Science and Technology Corporation (CASC) and closely resembles the U.S.-made General Atomics Aeronautical Systems’ MQ-9 Reaper drone. The Chinese UAV can carry a payload of up to 350 kilogram including Lan Jian 7 (Blue Arrow 7) laser-guided air-to-surface missiles, TG100 laser/INS/GPS-guided bombs, and AR-1/HJ-10 anti-tank missile – the Chinese equivalent to the American-made Hellfire missile. It is specifically designed for high-altitude missions over land and sea, and can fire its weapon from up to 5,000 meters. The CH-4 also “has a retractable electro-optical sensor turret, and a datalink back to the ground control station. The CH-4 also boasts a modern, two person control station to fly the drone remotely, with provisions for both line of sight and satellite communications,” Popular Science notes. The video clip also shows what appears to be Chinese support crew in the ground control station. China is incrementally gaining a larger foothold in the international arms market. “The design philosophy of the CH series drones [including the CH-4B] is similar to that behind the famous AK-47 assault rifle, which survived the emergence of advanced weapons, satellites, missiles and stealth fighter jets,” according to an analysis published in Air Force World. As I reported back in September (See: “China Unveils its Largest Killer Drone To Date”), the newest addition in the “Rainbow” series, the CH-5, recently made its maiden flight at an undisclosed airfield in Gansu province in China. The CH-5 also appears to be based on the United States’ MQ-9 Reaper drone design, boasts a wingspan of 20 meters and a takeoff weight of about 3 tons. It can carry a maximum payload of around 900 kilograms – which would be 2.5 times more than the CH-4s currently operating in Iraq. Beijing’s biggest combat UAV has made its maiden flight.